More than a decade after Ocean’s 13 wrapped up the Steven Soderbergh-directed franchise, we come back for more felonious shenanigans via 2018’s Ocean’s 8 with a new cast and director. 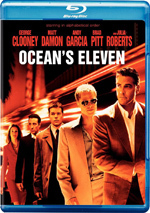 Danny Ocean’s sister Debbie (Sandra Bullock) shares his affinity for crime, and when she emerges from prison, she plans to pick up where she left off. Debbie wants to steal a diamond necklace worth $150 million, so along with partner Lou (Cate Blanchett), she assembles a team of specialists to pull off this massive heist. They get famous socialite Daphne Kluger (Anne Hathaway) to wear it at the Met Gala and scheme to burgle it. Whereas the 2016 female-centered Ghostbusters offered a pretty clear relaunch to that series, Ocean’s 8 straddles the line between sequel and reboot. Because it alludes to Danny and includes cameos from a couple of characters in the earlier films, it doesn’t offer an attempt to exist in its own universe, but beyond some fairly superficial elements, it lacks enough connective tissue to really feel like a sequel. Whatever one calls it, Ocean’s 8 becomes a disappointment. While it throws out occasional snatches of lively fun, it doesn’t live up to its potential. Like the prior films, Ocean’s 8 boasts an impressive cast. A trio of Oscar-winners, Bullock, Hathaway and Blanchett alone would deliver a solid core, but the film also features folks like Mindy Kaling, Helena Bonham Carter, Rihanna, Sarah Pauling and others. This team doesn’t quite compare with the roster assembled for the earlier flicks, but it’s a darned strong group. At their best, they provide some charm, but they don’t click in quite the same way as the Soderbergh cast did. That assemblage of talent really connected, probably because many of them were pals outside of the movie. The actors in Ocean’s 8 don’t seem to enjoy the same chemistry, and they never quite dig into the sense of delicious malice and cleverness the film needs. All provide more than competent work, but I can’t say any of them impress. Gary Ross directed and co-wrote Ocean’s 8, and he boasts the career of a solid pro. Unfortunately, he’s more of a journeyman than the inspired Soderbergh, so he fails to bring much zest to the proceedings. This means Ocean’s 8 feels a bit by the numbers. While it hits on all the expected notes and does so with reasonable life, it doesn’t embrace the scheme in the same vivid manner as Soderbergh. Honestly, Ocean’s 8 feels like a sequel/reboot that exists more for marketing than anything else. 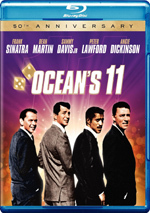 Granted, one could argue the two sequels after 2001’s Ocean’s 11 came to be solely because the first film made so much money, but at least those developed naturally in their era. 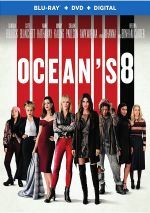 Given the long layoff between Ocean’s 13 and Ocean’s 8, there seems to be less of an organic path to the latter’s existence, and it comes across as more than a little calculated. That’s not a fatal flaw in and of itself, as plenty of movies created solely for profits work well nonetheless. And to be fair, Ocean’s 8 brings a perfectly watchable comedic caper film – it just never threatens to become more than that. While a decent romp, it lacks the zest and abandon it needs. 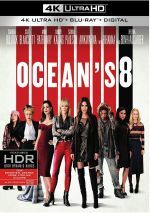 Ocean’s 8 appears in an aspect ratio of approximately 2.40:1 on this Blu-ray Disc. The movie offered a quality presentation. To the surprise of no one, Ocean’s 8 went with teal and especially orange. Tedious as those choices may seem, the image reproduced the colors as intended. Downconverted to Dolby TrueHD 7.1, the film’s Dolby Atmos soundtrack heavily emphasized music, as the nearly omnipresent score and songs filled all the channels. Effects took a backseat but they added some involvement, mainly during action sequences. Two Deleted Scenes fill a total of one minute, 53 seconds. The first offers a little background about the Met Gala, whereas the second shows a post-heist chat between Debbie and Tammy. Neither seems memorable. Also, some Ocean’s 11 alumni allegedly shot cameos – if so, it’s a shame they don’t appear here, though one assumes they must’ve been awful if they didn’t make the final cut. Three featurettes follow, and Reimagining the Met Gala goes for 12 minutes, 47 seconds. It includes comments from writer/director Gary Ross, writer Olivia Milch, executive producer Diana Alvarez, costume designer Sarah Edwards, Costume Institute at the Met’s Nancy Chilton, Vogue International Editor at Large Hamish Bowles, Met President/CEO Daniel H. Weiss, Met Head of Special Events Bronwyn Keenan, event designer Raul Avila, Vogue Director of Special Events Eaddy Kiernan, and actors Sarah Paulson, Sandra Bullock, Mindy Kaling, Anne Hathaway, Helena Bonham Carter, Cate Blanchett, and Awkwafina. The program looks at aspects of the Met Gala as well as costumes and related elements. Though it occasionally feels like an advertisement for the Met, it offers enough good details to deserve a look. A Heist In Heels lasts 11 minutes, 35 seconds and features Ross, Hathaway, Paulson, Bullock, Carter, Milch, Blanchett, Alvarez, Edwards, and production designer Alex DiGerlando. “Heels” looks at the film’s extension of the Ocean’s series and its adaptation in the female world as well as cast/performances, sets/locations and costumes. Plenty of happy talk results, but the show still comes with some useful information. Finally, Ocean’s Team 3.0 lasts 13 minutes, 20 seconds and brings notes from Ross, Bullock, Blanchett, Carter, Hathaway, Edwards, Paulson, Awkwafina and Kaling. Here we get more notes about cast, characters, performances and costumes. Given that “Heels” takes on the same topics, it seems unclear why the disc splits into two similar featurettes, but “3.0” nonetheless becomes another reasonably efficient reel. The disc opens with ads for A Star Is Born and Crazy Rich Asians. No trailer for Ocean’s 8 appears here. Though not a bad film, Ocean’s 8 disappoints. It fails to live up to its potential – and star power – as it turns into sporadic entertainment. The Blu-ray brings very good picture with positive audio and a decent set of supplements. If a sequel materializes, perhaps it’ll use its talent better, but Ocean’s 8 falls a bit flat.